Sometimes writing scares me. I have things I want to write about, exciting ideas that often come to mind while I'm doing something completely un-writerly like grocery shopping or exercising. My heart races a little bit, a shiver runs down my spine. I rummage around looking for a notebook and pen, a leftover to-do list, something to make a note of this amazing idea before it gets lost in the detritus of everyday thinking. Then comes the scary part. No matter how good I think the idea is, I'm afraid to start writing about it. Afraid to sit down in front of that blank computer screen and do the labor to bring that idea into the world. What is so frightening? What is it that stills my fingers and pushes that idea to the back of my mind? Is it the fear of failing - that I won't be able to do this thing justice, make of it what I know it could be? Am I worried that this magical notion really isn't magical at all, and that once I begin to flesh it out on the page it will turn into a deformed monster rather than a beautifully realized story? Could it be that I'm terrified of what I might discover about myself if I go deep enough inside my heart to bring this story to the world? Terrified to take the risk of exposing myself, my talent (or lack of it), my story? "The risk of writing is an internal risk," says Laraine Herring in her book Writing Begins with the Breath. "You brave the depths of your own being and then bring it back up for commentary by the world. Not the work of wimps. Many writers would likely rather climb Mt. 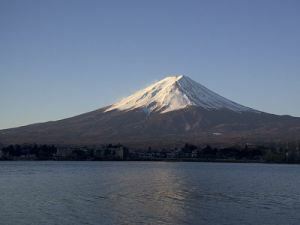 Fuji than go in there, but in there is precisely where you must go. You can't really prepare yourself for what's in there because you don't know all that's in there." I'm not a mountain climber. Sometimes- especially when it comes to writing- I'm a wimp. I'm afraid of the unknown, afraid of change. I don't like taking risks. But I do know that the well of ideas and emotions living inside me need to find their way into the world, need to come to life on the page. And I must find the courage to start putting them there. Anaïs Nin once wrote this: And the day came when the risk it took to remain tightly closed in a bud was more painful than the risk it took to bloom. I think I'm ready for that day. How about you? What fears stop you from writing? Are you able to take the risk and bloom?